Download Think Bayes in PDF. Read Think Bayes in HTML. Order Think Bayes from Amazon.com. Read the related blog, Probably Overthinking It. The code for this book is in this GitHub repository. Or if you are using Python 3, you can use this updated code. Roger Labbe has transformed Think Bayes into IPython notebooks where you can modify and run the code. I think this presentation is easier to understand, at least for people with programming skills. It is also more general, because when we make modeling decisions, we can choose the most appropriate model without worrying too much about whether the model lends itself to conventional analysis. Also, it provides a smooth development path from simple examples to real-world problems. 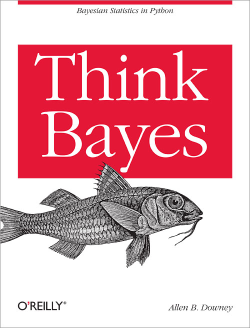 Think Bayes is a Free Book. It is available under the Creative Commons Attribution-NonCommercial 3.0 Unported License, which means that you are free to copy, distribute, and modify it, as long as you attribute the work and don’t use it for commercial purposes.